Ten-year-old Alex and his nine-year-old sister are staying with their Aunt Karina while their parents are working in Russia. Karina frequently reads the children Russian folktales. But she does more than read those tales, the children have discovered a fireplace that leads to a magic portal through which they become a part of that story. One day the children are on the porch when the summer weather suddenly turns stormy. Within a matter of minutes, snowdrops are swirling. Alex, Katie and their Aunt Karina retreat to the warmth of the house. Karina reads them a folktale about a girl named Masha who lives with her wicked stepmother, Darya. This stepmother ordered Masha to go into the forest and pick snowdrops even though it was still winter. 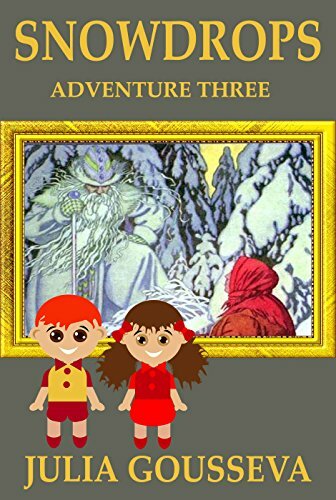 Alex, Katie, and Karina rush into the forest to save Masha and they proceed to have an adventure in which they meet Father Frost and move through all the seasons of the year. The children learn about the seasons and meet the Twelve Months of the Year. Will the children and their aunt be able to rescue Masha and prevent Darya from abusing her further? This is a chapter book that combines elements of fantasy with a Russian folktale and a travel adventure. There are no illustrations. I would recommend this book as a good choice for readers in third through fifth grade, but readers of any age who enjoy multicultural folktales will probably enjoy it.